Three of my relatives (two of my grandfather’s older brothers, and my grandmother’s oldest brother) are buried in the war graves of the Western Front. I’ve been meaning to visit them for some time now. This year I finally got round to it. This is a short account of my trip. Six o’clock on Sunday morning, and I manage to catch the alarm a minute before it goes off and avoid waking anyone else up. Breakfast, finish packing, and I’m heading down the motorway at the start of a two-day visit to Belgium and northern France to see where my family’s three casualties from the First World War are buried. Oddly enough, the longest single journey on the trip is the drive to and from Folkestone. I’ve picked shuttle dates and times to try and minimise the prospect of being caught in congestion on the M25. Exiting the tunnel shortly after 2pm local time, my first target is Poperinge, a Belgian town west of Ieper and close to the French border. Lijssenthoek is just to the south of the town. I miss the turning the first time I pass it, and only realise that I have when I see that I’m already heading away from Poperinge on the other side. Turning round, I retrace my course with the aid of Google navigation. Not that I need to, because the cemetery is signposted when approaching from this direction – but not from the direction I originally came from. My guess is that the assumption is that most visitors are coming from Ieper. Lijssenthoek Military Cemetery is huge. 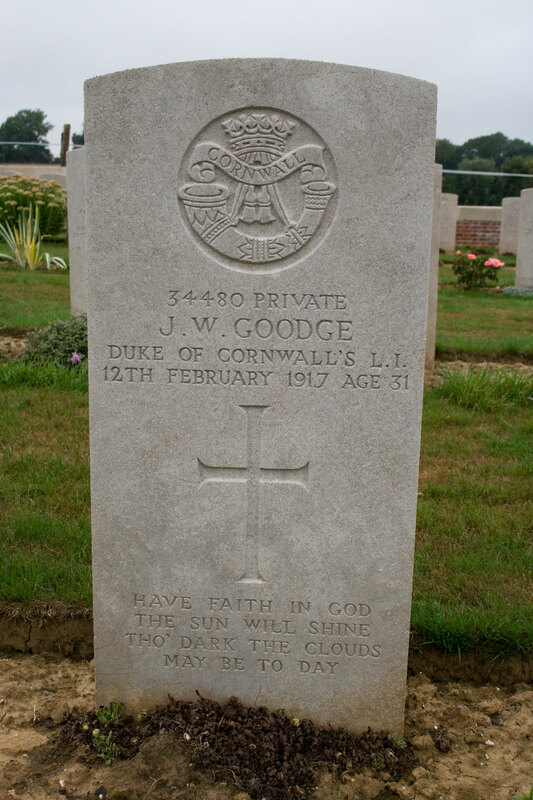 Over 10,000 casualties are buried there, which is more than the population of Littleport, Robert’s home village where his parents, Henry and Amelia Goodge, lived and worked the land. As well as Commonwealth casualties, the cemetery also has a sizeable French section, and, at the back, under the trees, a small row of German graves. One of the first things you notice is how close the gravestones are together. Unlike the municipal cemetery just down the road from where I live, there’s no space to walk around individual plots. Instead, the headstones stand in serried rows, shoulder to shoulder. There barely seems space for a grave in front of each one. That’s because there isn’t space. Only officers got a grave to themselves. Other ranks were buried two, or sometimes three, to a grave. The headstones stand side by side as close as possible to the burial plot. But they don’t mark its precise position. 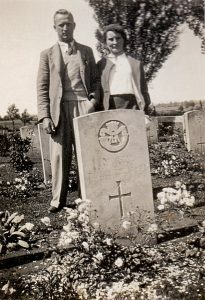 In some WWI cemeteries, casualties share a headstone as well as a grave. Interestingly, although the majority of gravestones are marked with the Christian cross, it isn’t universal. Casualties known to be members of other faiths use, where appropriate, their own symbol – for example, Jewish casualties have the Star of David on the headstone. Others have no religious symbol, but use appropriate inscriptions. A Sikh casualty has text in Gurmukhi script. A Chinese labourer has his name written in Chinese. This early example of multiculturalism contrasts somewhat with the French graves, which are uniformly crosses. 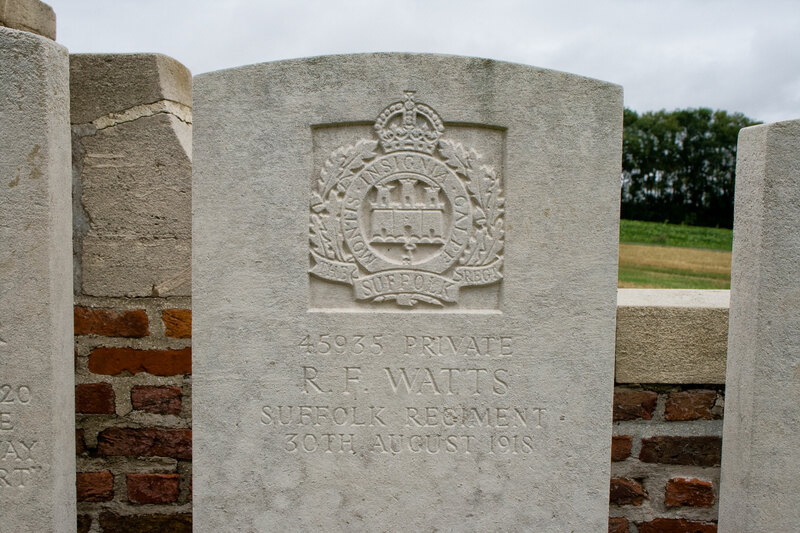 Robert served in the 2nd Battalion of the Suffolk Regiment. The original 2nd Battalion had effectively been wiped out at the Battle of Le Cateau on 26 August 1914. Robert avoided that action, and survived the battalion’s involvement in the Winter Operations of 1914-1915. But, on 22nd January 1916, while the 2nd Suffolks were engaged in trench warfare near Ieper, Robert’s luck ran out. It was a fairly quiet time for the casualty clearing centre. Only four people died that day. There’s a timeline on the wall of the cemetery visitor centre showing the number of deaths per day. Mostly, it’s in single digits or low double digits. Later, it rises to the hundreds. 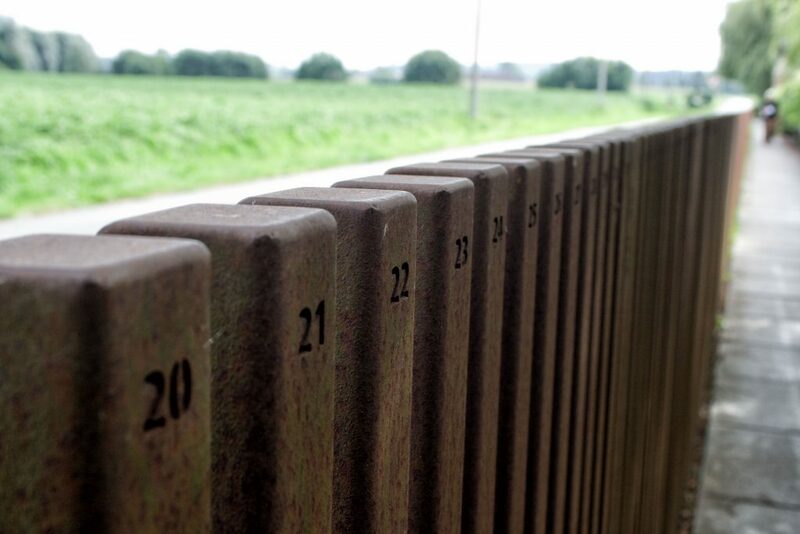 In front of the cemetery there’s a row of iron bars, one for each day of the war that contributed casualties to Lijssenthoek. The number of casualties each day is shown by the number of notches at the base of the bar. It feels a bit strange to be standing in front of a gravestone with my surname on it. It’s not the first time, of course, all of my grandparents are now deceased and I’ve stood in front of their graves. But it’s different when it’s the grave of someone who has lived a full life, and someone whose life was cut short in its prime. The cemetery is, as you might expect, busy. A coach party arrives while I’m there. The centenary of the war has increased visitor numbers. But it still feels sombre, reflective. Despite the number of people walking round, it’s practically silent apart from the sounds of nature. Conversations are in hushed tones, and soaked up by the grass and flowers. Any death in combat is a tragedy. But some deaths are more tragic than others. Robert was young, he had no wife or children, and the family he did leave behind were strong enough to cope. The same wasn’t true of the other casualties I am here to pay my respects to. Leaving Lijssenthoek, I head for Ieper (or Ypres, as it’s more commonly known in English), where I’m staying the night. After checking into my hotel, I have time to spend in the town. I’ve been to Ieper before, when I briefly worked in Brussels back in the 1990s. Had I known then that one of my relatives was buried nearby, I’d have paid a visit to Lijssenthoek too. But, I didn’t. The town itself is still very recognisable, but it feels a lot more vibrant – there are more people in town, despite it being a Sunday evening, and the Grote Markt and the road leading to the Menin Gate are lined with bustling cafes and restaurants. How much of that is WWI centenary tourism, and how much is the local economy, is hard to judge. The Menin Gate itself is certainly a focus of a lot of centenary commemoration. The stairs leading up from ground level to the ramparts are lined with flowers and wreaths, and in between the gate and the Indian Forces memorial is a display of wreaths from British Legion branches across the UK. They aren’t in any kind of order, but, after systematically walking through the display I find those from both where I live now and where I come from – which, of course, is also where my great-uncles are from. Monday morning, 8am local time and I’m on the road again. Leaving Belgium behind, I cross back into France just north of Lille. Both of today’s destinations are just outside Arras, about an hour and a half away. It’s rush hour in France, but it’s also the holiday period and traffic is lighter than I’d expected (and Google had predicted), so I’m not spending too much time in jams. It’s a dank, grey morning, and drizzling a bit. This time, I make no mistake with my navigation and reach the village of Wanquetin, to the west of Arras, without any difficulty. Unlike Lijssenthoek, Wanquetin Communal Cemetery Extension is tiny, containing just 232 graves. As the name suggests, it isn’t even a standalone site. Instead, it’s a small area tacked on to the rear of the village’s regular municipal cemetery. There’s no car park, no visitor centre, and nobody else here except me – although a van containing workmen from the Commonwealth War Graves Commission does turn up while I’m there. 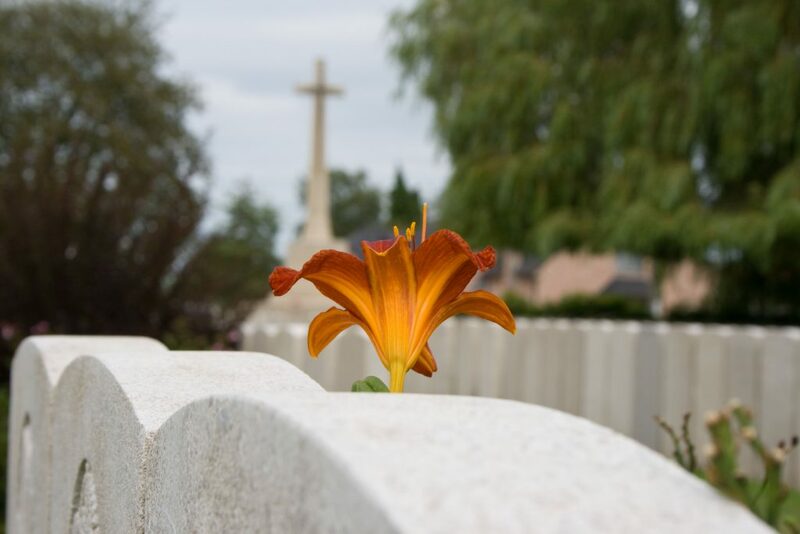 Despite that, it’s still instantly recognisable as a CWGC site – the white gravestones laid out in rows and the Great Cross following the standard design. John served in the Duke of Cornwall’s Light Infantry, 6th Battalion. 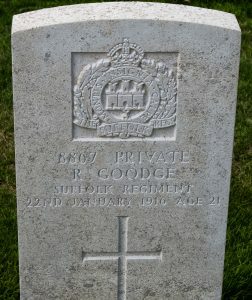 According to the CWGC website, he also served in the Military Foot Police. Like his younger brother Robert, John doesn’t appear to have died in any particular key battle. In the terminology of the time, he was just “trench wastage” – a casualty suffered as a result of artillery fire on soldiers who were manning their own trenches, not actively attacking the enemy. That may make him sound particularly unlucky, but that’s far from the case. Although the big set-piece battles generated a lot of casualties in a short space of time, they were also relatively infrequent. Overall, more servicemen died in their own trenches than when going over the top. One of the most grindingly depressing statistics of WWI is the number of casualties – on both sides – suffered for no gain. Trench warfare was so effective defensively, but so ineffective offensively, that for much of the time the combatants just lobbed shells at each other in the hope that the enemy would run out of recruits before they did. John’s grave has a particular resonance for me, as one of the earliest photographs I have of my own grandfather is of him and my grandmother (or my nan, as we called her) visiting John’s grave, some time in the inter-war period. 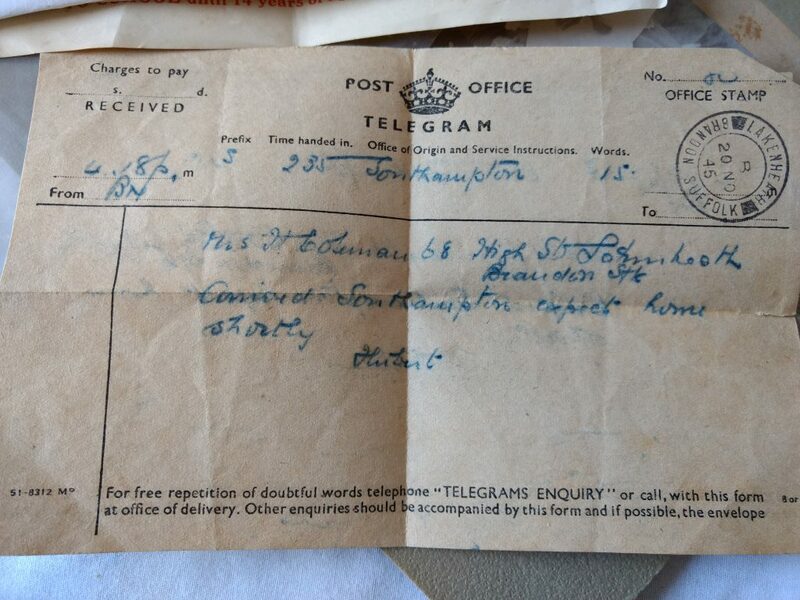 Grandad was fortunate, he was too young to fight in WWI and, as a farmer, too important to the war effort at home to be allowed to fight in the next – something for which I am incredibly thankful. No immediate members of my family were killed in WWII, although my other grandfather – my mum’s dad – did get called up, and served in the Far East. I’m glad that I’m alone here in Wanquetin cemetery. This is a far more emotional experience than Robert’s grave, and don’t particularly want to share that with other visitors. Unlike Robert, John was not young, free and single when he went to war. On 17 October 1907, at St Leonard’s Church, Little Downham, John married Emma Jane Martin. John and Emma had one child, a daughter, Mary, born in 1911. John’s death left Emma a single mother. But worse was to come. Six months later, Emma died – her death certificate described the causes as peritonitis and a gastric ulcer – leaving Mary an orphan at the age of six. Nobody knows what happened to Mary. It’s likely that she was brought up by her aunt and/or grandparents. But she disappears off the record books. There’s no death certificate in her name, no marriage certificate, no entry in the census. The most plausible assumption is that, in the care of her mother’s side of the family, she took their surname and, possibly, a new given name as well. But that’s just speculation. I’ve often wondered what happened to Mary. Standing here, at her father’s grave, it’s impossible not to think of what might have been had he not died. My own children aren’t much older than she was when she was orphaned. Joseph Stalin is reputed to have said that one death is a tragedy, but a million deaths is a statistic. Around 15 million people died in WWI, but every single one of those deaths was somebody’s personal tragedy. John’s death was Emma and Mary’s. And here, just over a hundred years later, I still feel it. The drizzle has stopped, and the skies are brightening a bit, as I leave Wanquetin. It’s only a short drive to my next, and final, destination, the village of Ecoust-Saint-Mein. There’s no inscription on Ralph’s gravestone. Not every gravestone has one, for a variety of reasons. One of the most common was cost – the relatives had to pay to have one added, and not everybody could afford it. But that wasn’t the issue in Ralph’s case. Ecoust-Saint-Mein British Cemetery is another small one, although in this case it is standalone rather than being attached to a domestic cemetery. It contains 143 graves, all from the First World War. I’ve deliberately left Ralph until last. Although he doesn’t share my surname, and left no widow or children, his death was part of a chain of events that brought me into the world. He’s also the only one of the three that I have a photograph of, and the one I know most about. 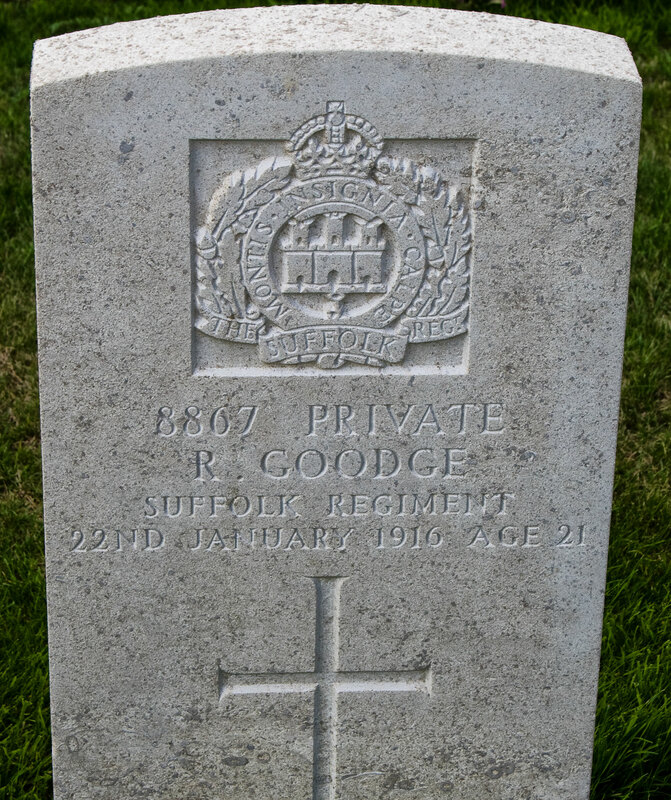 Ralph served in the 2nd Battalion of the Suffolk Regiment, the same as Robert Goodge. Whether they actually knew each other is a matter of speculation. Although their respective families were later to combine to form my own immediate ancestry, there’s no reason why they would have had any link at the time. They came from different villages and weren’t in any way related. The records say that Ralph was the son of Grimmer and Rebecca Watts, of Burwell. He was their son, certainly, but by the time he died he had no father. Grimmer had died six months earlier. From all accounts, Grimmer’s death was sudden. Rebecca was still mourning him when news of Ralph’s death came through. Relatives reported afterwards that Ralph’s death barely seemed to register with Rebecca, she just mentally tuned out the news. That’s why there’s no inscription on Ralph’s gravestone. She seemed, at the time, almost cold-hearted about it. Not that that tells us anything about how she actually felt. Grief hidden can be just as powerful as grief displayed. But the practical consequences of losing her husband and eldest son in a short space of time caused a family upheaval that saw Rebecca sell up the family business and, with her younger children, move back to the village of Lakenheath where she had grown up. And the person hit hardest by the upheaval was Ralph’s sister Hannah, my grandmother. At the age of 13, her life was turned upside down and almost everything she loved was lost. Again, I’m pleased that I’m alone in the cemetery. Robert’s death was pointless, John’s death was tragic, but neither affected people I knew to the extent that Ralph’s did. Henry and Amelia Goodge, and the rest of their children, got on with life after John and Robert’s deaths. And, to be honest, not a lot changed for them. But Ralph was different. Standing in front of Ralph’s gravestone, I’m acutely aware that I’m looking at something which did affect people who were close to me. I can only imagine how Emma and Mary felt when John died. But I know how Hannah felt when Ralph did. And that knowing makes it impossible not to feel it, too. To share Hannah’s grief. Here, in a small cemetery in rural France, I feel more connected to my grandmother’s memories than I ever have done. And I can feel the tears on my cheek as I sit on the cemetery wall and try to make sense of it all. And I’m glad I came. Glad that I’ve been able to pay my respect to my family members who made the ultimate sacrifice. And angry, too, that so many lives were wasted for so little. Unlike Robert and John, Ralph did actually die in battle. The village of Ecoust-Saint-Mein was captured by British forces in April 1917, lost again in March 1918 and retaken in August 1918. It was during this final battle that Ralph was killed. That may seem a little pointless, for a tiny village of no strategic significance. But this battle was part of the “Hundred Days Offensive”, the Allied advance that finally pushed the German forces out of France and culminated in the Armistice agreement. It’s no comfort now, but Ralph’s death was, at least, worth it for the war effort. Midday on Monday, and I’ve finished my tour of cemeteries. I’ve got some USB sticks of music with me in the car, because I can’t listen to the radio (well, not my normal station, anyhow) while I’m outside the UK. Somehow, though, I haven’t felt like listening to music, so all my previous driving south of the Channel has been in silence. It just hasn’t felt right. But now, with half a day to spare sightseeing before I need to catch the shuttle back to England, the atmosphere is different. And the sun has come out, too. I wind the window down, shove a stick in the player and head out across the French countryside. 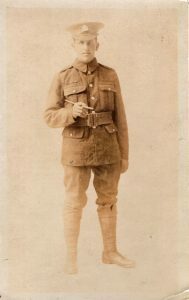 Having lost her brother and father, and seen her mother have to cope as a widow and single parent, the joy of knowing that her husband had returned home safely from his war was news she was desperately hoping for. And it meant that my parents’ generation – mum, and Uncle Peter – didn’t have to go through what she had. The best letter, indeed.